This is a 178 page guide and is different from our larger guides in that it is intended to be a driving guide only and does not include photographs, quotes from emigrant diaries and other information that is included in our main guides. 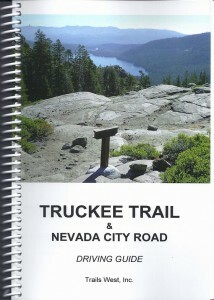 This book was published to provide a current guide to allow anyone to be able to follow these trails from marker to marker from the beginning at Humboldt Bar, Nevada to Johnson’s Ranch in California. These two historic Trails are still visible in many locations and can be hiked on and driven over. This unique feature allows the modern day user to visualize what emigrants experienced as they traveled over these trails. There are detailed maps, complete driving directions to each marker, GPS latitude/longitude and UTM coordinates for each marker, and a brief history of the trails you will be driving on. For a photo tour of the Truckee Trail click here.